One year ago, on 28 April 2016, the Cambodian Government arrested five prominent Cambodian human rights defenders. Four senior staff members from the NGO Cambodian Human Rights and Development Association (ADHOC), Mr. Ny Sokha, Mr. Yi Soksan, Mr. Nay Vanda, and Ms. Lim Mony, and Mr. Ny Chakrya, a former ADHOC staff member who now serves as Deputy Secretary-General of the National Election Committee. They have been in pre-trial detention ever since, with more than ten bail requests being denied. On Thursday 27 April 2017 their pre-trial detention was extended for another six months. 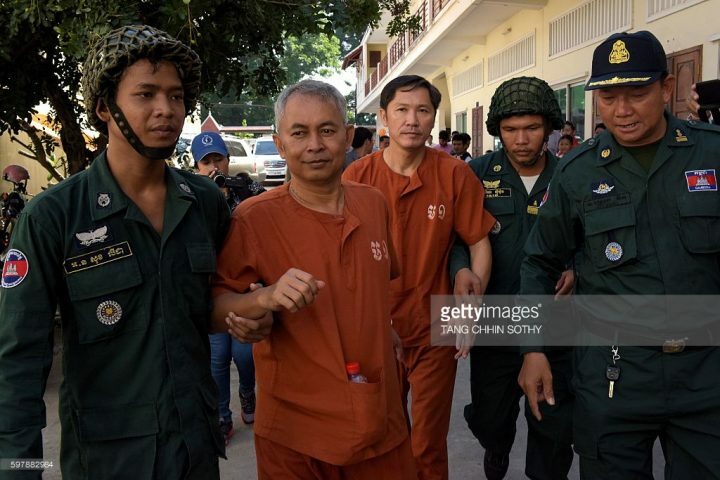 Thun Saray himself was forced into exile last year after he was intimidated and threatened for calling for the release of his staff and colleagues. Cambodian officials arrested the five human rights defenders after the Anti-Corruption Unit (ACU) submitted charges against them for bribing a witness, being Khom Chandaraty, also known as Srey Mom, a woman alleged by the Cambodian Government to have had an extra-marital relationship with opposition leader, Kem Sokha. ADHOC has consistently maintained that she only received legal advice and reimbursement of food and transport costs, provided as a matter of policy to all persons seeking legal support from ADHOC. Their predicament is an example of crackdown on human rights defenders by the Cambodian Government that has swept up the five, and has had a chilling effect on other human rights defenders in the country. More so now, as the country holds commune elections in June 2017, and then national elections sometime in 2018. Many other human rights defenders and activists have been harassed and persecuted too. Among them Tep Vanny, one of the most prominent land-rights defenders in the country, who was sentenced to two-and-half years in prison in February 2017 for her involvement in peaceful public protests. “Targeting human rights defenders and human rights organisations has unfortunately become a predictable pattern in Cambodia. Challenges to the government are not tolerated. Cambodia is at a turning point, and if the situation deteriorates even further, particularly when it comes to freedoms of expression, association, and peaceful assembly, it cannot claim to be a human rights respecting country anymore,” said Betty Yolanda, Director of the Asian Forum for Human Rights and Development (FORUM-ASIA). Another part of this increase in Government intimidation against human rights defenders, civil society and the political opposition has been the amendment of the Political Parties Law that will allow easy suspension or dissolution of political parties by the Ministry of Interior, and the passage of the Law on NGOs (LANGO), which have had dire consequences for the rights to freedom of expression, assembly, and association in Cambodia. Human Rights Watch and FORUM-ASIA urge the Government of Cambodia once again to end its crackdown on human rights defenders and ease the harsh restrictions on civic space. The immediate release of the five human rights defenders would be a good place to start.